Jill Stein, the presidential Green Party candidate, arrives for a news conference in front of Trump Tower, Monday, Dec. 5, 2016, in New York. 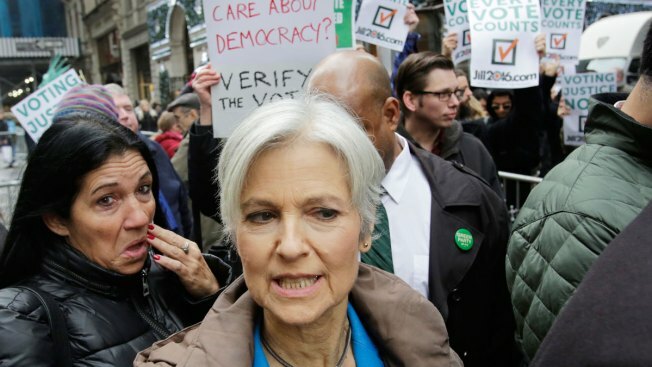 Stein is spearheading recount efforts in Pennsylvania, Michigan and Wisconsin. Michigan has started its presidential election recount. Oakland County, in the Detroit area, started re-counting its votes Monday after a federal judge ordered elections officials to get the process moving to meet a Dec. 13 deadline. In his ruling Sunday night, Judge Mark Goldsmith rejected an effort by state officials to delay the hand-counting of about 4.8 million ballots. Ingham County also started Monday, and other counties will follow this week. Stein has also requested recounts in Pennsylvania and Wisconsin. Republican Donald Trump narrowly defeated Democrat Hillary Clinton in all three states on his way to victory. Stein won about 1 percent of the vote in each of the three states. Stein said Monday her efforts are "about ensuring that all votes are counted and that voters can trust the system." Her news conference outside of Trump Tower in New York City had a circus-like atmosphere, as some of President-elect Trump's supporters heckled Stein. Wisconsin's recount started last week. Stein revived her efforts for a Pennsylvania recount as promised Monday by filing a complaint seeking a full statewide recount, based on alleged issues with the voting machines used in the state. Green Party lawyers filed a lawsuit in a Philadelphia federal court earlier Monday asking a judge to order a recount in Pennsylvania. Meanwhile, Michigan's appeals court will hear arguments Tuesday on a Trump request to halt the recount.